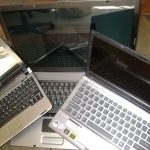 With sales approaching only 400,000 units in 2007, netbook sales exploded in 2008 reaching 11. 4 million units. Small, light, and super-portable are the catchwords describing a netbook. Definitions vary but the determining factors are price and size. Generally they have a screen size of 10″ or below, a reduced power/performance processor with 1.0 and 1.6 gig. the most popular of sizes. Price is dictating the use of limited amounts of memory but drive size has been creeping up.